Over the years, we have become huge fans of Memoria Press. 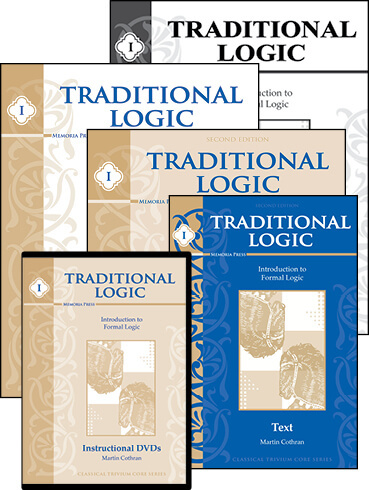 We were recently given the opportunity to review their Traditional Logic I complete Set. I chose this option because as I have mentioned in other postings Mr. B is needing to improve his executive functioning skills and I thought this could possibly help with that. The Traditional Logic I Complete Set includes everything you need to implement this program. You receive the student text student workbook teacher key, tests and quizzes book, and instructional DVDs. I was pretty excited when the box arrived in the mail, and I ripped into it right then. I called for Mr. B and we started sifting through everything together. I opened the student text and my immediate thought was "Oh dear! I've made a huge mistake!" It looked pretty complicated. Like, make my brain hurt complicated, but I wanted to give it the benefit of the doubt. I had looked over the samples online, so I was still kinda confident I had made the right choice. I spent a couple of days trying to familiarize myself with the teacher key before having Mr. B jump in. As I read through, it became less and less intimidating to me. Of course, silly me didn't think to pop in the DVD first. That would have just been too easy, right?! Anyway, after a few days of worry and fretting, I just decided to dive in and let Mr. B take off. Well, suffice to say, he's better at some things than I am because he didn't have a bit of unease or trouble! The kid is a natural. We have had to move a little slow on some things because, in my opinion, it's still a bit abstract and autism lends itself to the more concrete. This is great for building the weaker parts of his brain! There's a review chapter, and also a glossary with other information that comes in handy. I have Mr. B read the day's selection with me, then I have him watch the DVD instruction and go back over the text. It is then that he works in the student text. This pattern seems to be the most efficient for our situation, and helps him retain more and do better in the student workbook. Plus, I don't always have time to watch the DVD with him, so by reading it over first I can better help him when he needs a little guidance. Overall, this has been really good for us and we plan to continue using this. I'm seriously considering level II for next year as he's been doing so well with this one. Autism and Logic seen to go hand in hand with each other as it is challenging enough to provide some needed stimulation while also not crossing the point of frustration where he will just shut down. He likes the more complicated reading and work, and thus far excels with it. We have to move a little slower because he seems to suffer from fatigue after so long, so often we will do this pattern twice a week and only do one other subject on the same day. On the other days he will watch only the DVD or read a selection in the book. This is working well for us, and it's nice that these are physical products that allow for this sort of modification to be made. Memoria Press was super amazing and sent The Homeschool Review Crew all sorts of goodies to review. Please click the banner below to read more of those reviews!